Denys Wortman is a photo enthusiast, former Tisbury selectman and pilot living in Vineyard Haven. He’s also Board member of The Martha’s Vineyard Museum. For more information contact Denys at dwortman8@gmail.com. Michael Blanchard has been photographing Martha's Vineyard for the last six years and is the owner of the Crossroads Gallery in Oak Bluffs. Michael is an author and writer, and attaches words to images on social media to inspire individuals with addictions to seek help and pursue recovery. “Michael Blanchard Inspirational Photography” on Facebook, has over 50,000 fans and serves to connect people seeking help, using the power of imagery. When asked how he got into drone photography he says, “I have the emotional brain of a 4 year old and it seemed like a really cool thing to do!!! 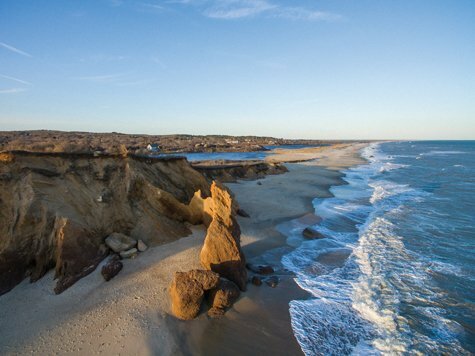 I have a child-like curiosity and wanted to see Martha’s Vineyard from an entirely new perspective. I also like to play with cool toys!! .” He intends to get into videography and make short clips that can be used to motivate people with mental health and substance use issues. David is a full-time professional commercial, editorial and fine art photographer as well as a FAA licensed remote pilot (sUAS). He started his commercial photography business in 2006 on the Vineyard and began offering drone photography and video services in 2015. Along with his still photography business he now offers aerial drone photography and video services including drone surveying, mapping and modeling services. “I’ve had no mishaps to speak of yet,” he laughs, “I try to be super careful and abide by all FAA regulations. I call the MVY airport tower for ATC (air traffic control) flight approval whenever I'm planning to fly in Class D airspace (all subject to ATC clearance), which is a over a large portion of the Island.